More than 20 years have passed, but Rounders remains, for most of this generation of poker players, the quintessential poker movie. The nostalgia around the flick remains thick as ever. Most poker players have seen the movie so many times that they can recall the lines more readily than a family member's birthday. On Monday, Rounders co-writer Brian Koppelman gave those poker players a late Valentine's Day present: he posted the third draft of the Rounders screenplay he and David Levien produced, on his personal blog. "I read it and I see very young versions of David and me," Koppelman wrote. "But I also see all the work we put into telling the story in a language that hadn’t been used very often. This made it harder to sell, but more distinctive, so that when someone liked it, they very likely loved it." Koppelman: "I also see all the work we put into telling the story in a language that hadn’t been used very often." Indeed, though the movie received only decent reviews — it has a 54/100 on review aggregation site Metacritic — poker players everywhere have latched onto it and given it cult status. Those players will find the 126-page screenplay a fun trip and nostalgic read. Almost every scene and line will be instantly recognizable, but there are some notable changes and tidbits that stand in contrast to the final product that hit theaters on Sept. 11, 1998. One of the first things that pops out is the name of the protagonist. 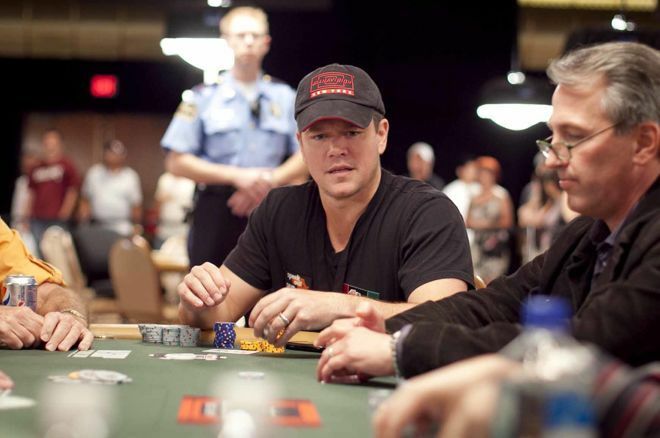 Poker players everywhere know the trial and tribulations of Mike McDermott, not just on the screen but because they're the same struggles nearly every poker player experiences while trying to rise through the stakes. Except, Mike McD was supposed to be Matt McD. That's the name that populates the pages of the screenplay more than any other. Koppelman said on Twitter that the casting move to hire Matt Damon resulted in the change. "We felt like it might seem weird to have Matt play Matt," he wrote. A new first name isn't the only change to McDermott. At various times throughout the screenplay, McDermott is described as toting an unlit cigarette in his mouth, something Damon's character never actually does in the movie. Koppelman: "We felt like it might seem weird to have Matt play Matt." In fact, a number of characters smoke in the screenplay who don't do so in the movie. Archnemesis Teddy KGB has undergone some changes as well. Just like in the final version, KGB meets McDermott at the door to his game. Described as "burly" with a "thicket of curly black hair," however, KGB doesn't sound much like John Malkovich, distinctly bald and thin. Judge Petrovsky, McDermott's eventual savior, has also transformed from a "large bearded man" to Martin Landau: rail-thin, clean-shaven and bespectacled. Every film that makes it to a final release can be expected to have undergone numerous changes en route. Editing is a key part of moviemaking, and a number of edits stand out, shifts from the screenplay draft released by Koppelman to the final product that became a staple of poker culture. Right from the beginning, there's the scene where McDermott goes bust to KGB's aces full. In the actual movie, there are some voice overs and the time from when McDermott sits to the fateful hand where KGB coolers him is fairly quick. The screenplay, however, builds the scene for a little longer mixing in some more detail about the players at the table. There are a couple of more hands, including one where KGB coolers another player's aces full while hinting at his trademark tell and eating a cookie. Plus, another player is caught cheating and kicked out, his dough confiscated. McDermott: "I might not be holding much, but I know what I've got inside, and I know what I can do with it." One of the key characters, of course, makes his entrance early in the film, just after McDermott visits the judges' game: Lester "Worm" Murphy, whose original last name looks to have been Friedman. In any case, Worm's release from prison kickstarts the movie's plot, but a bit more backstory on the Worm-McDermott friendship is provided by Worm himself in the screenplay. Turns out, Worm and McDermott first met as children after McDermott went bust for the first time — with baseball cards, not poker money. "One day, this kid's climbing the stairs, tears and snot running all down his shirt," Worm said of McDermott. "Not a baseball card, no Topps, no Fleer, no nothing, left in his shoebox." Worm proceeds to teach McDermott some tricks, but McDermott insists he's done with the game. In a bit of foreshadowing, Worm apparently coaxed him out of retirement and into a lucrative run of winning valuable cards. Most of the rest of the story unfolds as in the movie for the next hour or so. Although, a nod to feel players everywhere comes off the script — though game-theory optimal poker wasn't really a thing back then — when Worm and McDermott split up after the cops beat them and leave them in a bloody mess in the parking lot. Koppelman: "All credit to [director] John Dahl who realized that the symmetry would be better if after watching Johnny Chan, McD bluffed Johnny Chan, not Phil H."
"You wanna know what I've learned?" McDermott says in the cut dialogue. "At the table, in the real game, friends can't help ya. It all comes down to what you're holding and what you've got inside yourself. I might not be holding much, but I know what I've got inside, and I know what I can do with it. "I don't know what's gonna happen to me but at least I've got that." One of the biggest changes from the movie comes when a desperate McDermott seeks out Knish to try to borrow some scratch. Knish delivers much of the same sanctimonious speech, but he also delves more into his own backstory, which got cut from the final release. Apparently, Knish was a basketball player in his youth, and a damn decent one as he says he was third-team All-America at St. John's. Then, Knish blew out his knee and got cut from the team, "loosed like dead weight." Eventually, Knish found poker, and he learned to make cold decisions like the one he's making when he denies McDermott a loan. Just like in the movie, McDermott stops Knish from leaving, though. He has one last thing to tell him, and it's about the time when he sat down with a poker legend. Instead of Johnny Chan, though, it's "Helmuth" [sic] whom McDermott runs into, sitting $300/$600, "tall as a tree, lanky. Loose." McDermott proceeds to sit with Phil Hellmuth, and he goes into a little more detail when describing how he played back at the legend. In fact, the cut dialogue includes some more technical terms as McDermott talks about going on a late-position steal against Hellmuth's big blind then putting in a four-bet with nine-eight suited. 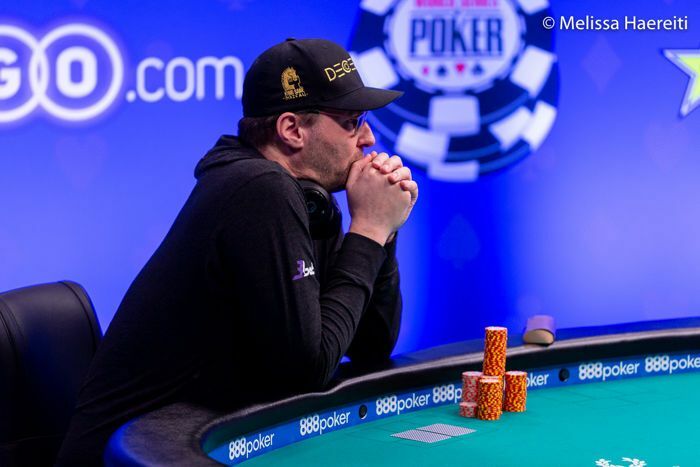 Then, on the king-king-jack flop, Hellmuth leads into McDermott and McDermott raises and wins the pot. Koppelman explained the change on Twitter. "All credit to [director] John Dahl who realized that the symmetry would be better if after watching Johnny Chan, McD bluffed Johnny Chan, not Phil H," Koppelman wrote. "We chose Phil originally because I had sat at that table as described." The heads-up match between McDermott and KGB, the climax of the movie, has been one of the most popular and celebrated scenes in the movie. Malkovich's legendary performance and quotable bits in a thick Russian accent have served as table-side fodder for countless poker players to rehash. Teddy KGB: "Hanging around, hanging around. Kid's got alligator blood. Can't get rid of him." "Hanging around, hanging around. Kid's got alligator blood. Can't get rid of him." In the original script, however, it wasn't alligator blood used as a descriptor for McDermott. Instead, KGB spits out that McDermott is "like a f****** leech" whom he can't get rid of. Eventually, just like in the movie, McDermott gets his man by slow-playing the nut straight, giving a happy ending to Rounders and inspiring a generation of poker players.